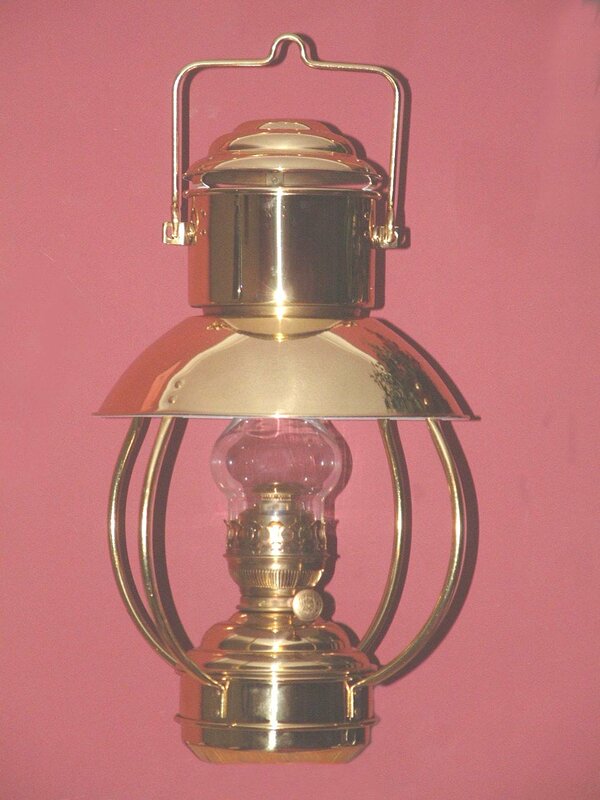 Our range of best quality oil lamps is ideal for cottages, boats, standby lighting or just practical decoration..! 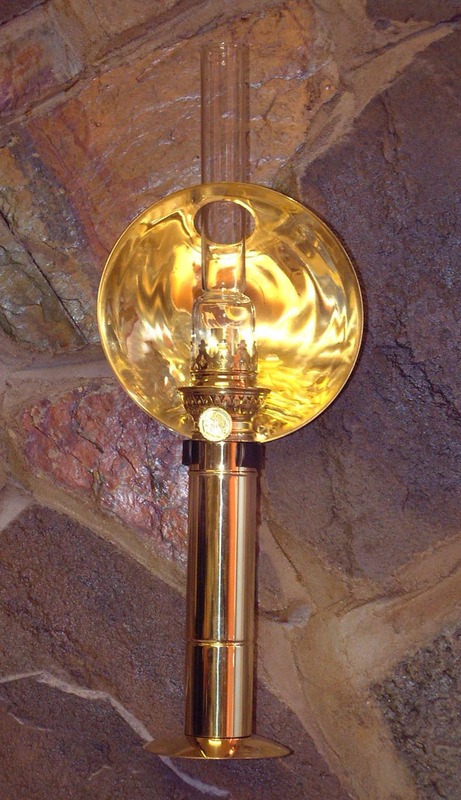 Each lamp is beautifully made in brass and comes complete with wick, ready to use. We also stock spare wicks, glass chimneys and burners to keep your purchase in working order for years to come. No other supplier can match our spares service! If you prefer original 'old' and 'vintage' Duplex burner lamps click here..! The glass quality is, however, very poor so we fit these with our best quality, heatproof candle glass chimney. This lamp is therefore not available anywhere else to this specification. 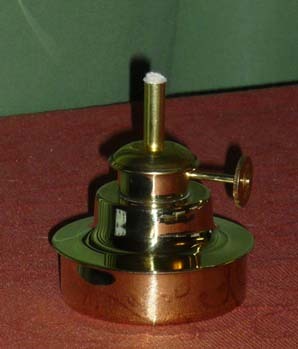 A high quality round wick burner fitted to a brass tank. Ideal as a replacement burner for railway lamps and marine lamps. Overall height 3 3/8", tank diameter 3"
A simple and attractive table or wall lamp! The classic 'non-explosif' French lamp used for over 100 years in homes and by Vintners, (winemakers), to check the wine in the cellars. The 2 line, round wick brass burner gives simple light, burn time approx. 10 hours/fill. Traditionally the lamp runs on lighter fuel or 'white gas' from camping shops. However clean low sulphur paraffin can be used. A simple table lamp to grace any home! Available with a 14 line Brass Kosmos burner or 15 line brass burner with flame spreader. Gives a good light, burn time approx. 16 hours/fill. Overall height 20", total width 5 3/4"
Also available with an opal white or green shade, 7" in diameter, on a brass carrier. The opal shade is pictured on the #8816 table lamp below. As the name suggests this lamp would have originally been used in the pantry, (food cupboard), of large houses. The black enamelled bracket is fixed to the wall and carries the polished brass reflector. The lamp can be unclipped from the bracket and used as a small table lamp or carried to darker corners of the room, (or pantry..!). 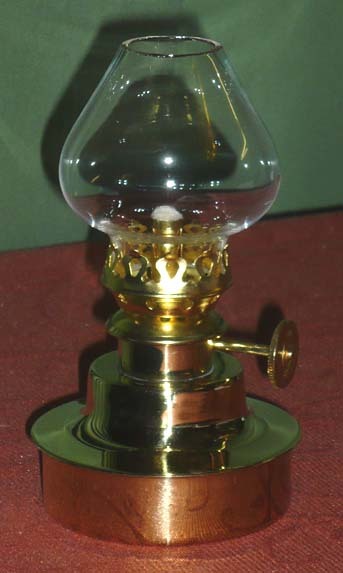 Lacquered brass fount with 14 line Kosmos burner, burn time approx. 20 hours/fill. Overall height 10 1/4", total width 5 5/8"
The perfect wall lamp for confined spaces. The polished brass reflector and tank are integral, though the whole lamp can be easily unclipped from the wall for filling. 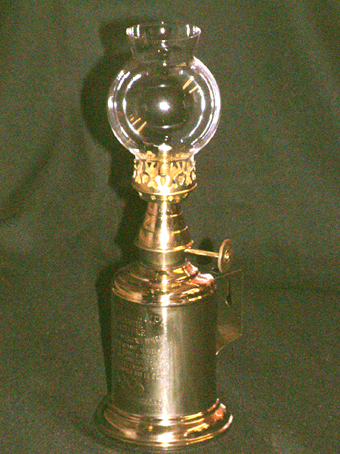 Lacquered brass fount with 14 line Kosmos burner, burn time approx. 40 hours/fill. Overall height 10 5/8", total width 5 3/8"
Lacquered brass fount with 14 line Kosmos burner, burn time approx. 60 hours/fill. Overall height 16 1/2", fount diameter 4 3/8", total width 8 5/8"
The classical cabin lamp with gimbal and smoke bell, perfect for use on a boat or even in the home. 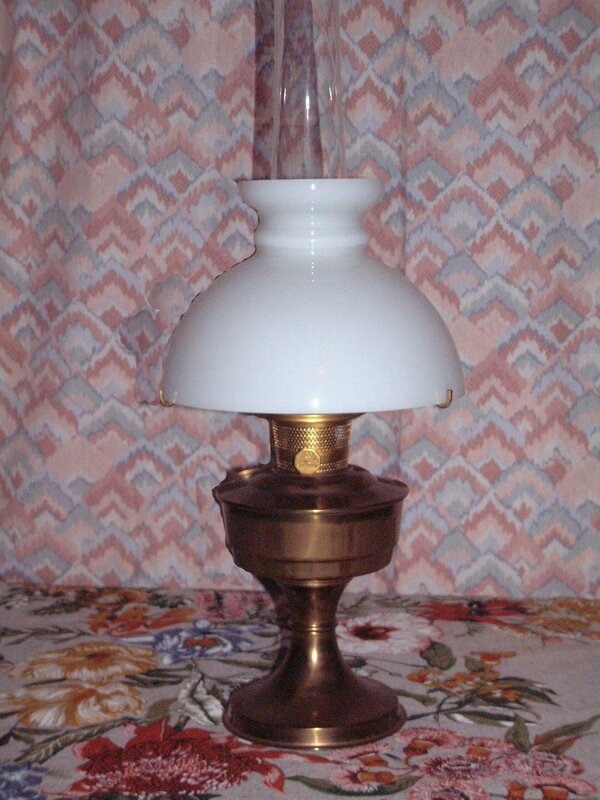 The lamp can be removed from the brass gimbal and used as a small table lamp or carried to darker corners of the room. 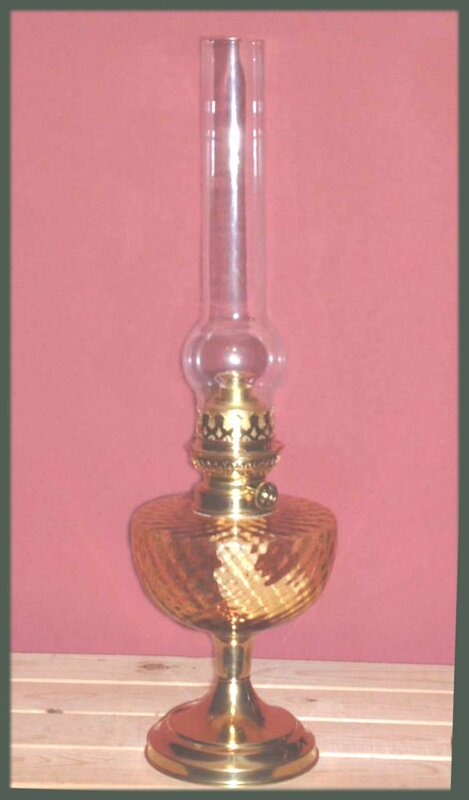 Lacquered brass fount with 1" flat wick burner, burn time approx. 25 hours/fill. Recommended overall height to top of smoke bell bracket 13 1/2", total width of gimbal 3", overall height of lamp 10 1/4"
Originally designed in 1916 and used by the Swedish railway this attractive oil lamp is in the style of the spring-loaded candle lamps used in the UK. The design allows the lamp to be removed and carried or stood on a table. By passing the chimney through the reflector the light is concentrated at a maximum. Still made in the same Swedish factory by skilled craftsmen. Overall height 17", total width 6 1/2"
Originally a hanging lantern for the cargo hold in ships. The fount and glass chimney are enclosed in a brass case with protection wires across the glass windows. Access to the lamp is by a bayonet fitting in the bottom of the case. Lacquered brass fount with 10 line Kosmos burner, burn time approx. 25 hours/fill. 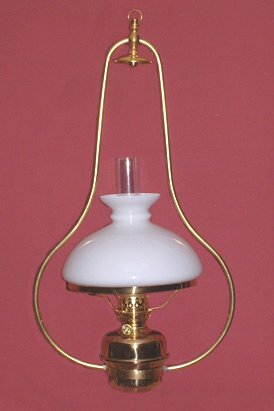 Overall height 16", total width 7"
The classic Aladdin incandescent mantle lamp with a heritage back to the early 1900's. Brass burner and fount with heatproof glass chimney. Approx 80cp of totally silent light from the exclusive 'Loxon' mantle & tubular, side draught wick. Burn time approx. 5 hours/fill. Originally designed as a hanging lantern for the wheelhouse on fishing trawlers. The fount and glass chimney are in a brass frame with the reflector painted white inside. Lacquered brass fount with the best 20 line 'Ideal' burner, burn time approx. 30 hours/fill. Overall height 20", total width 12"
Exclusive to Base Camp this lamp is a traditional style lamp hung over the dining table in a cottage kitchen. The fount, glass chimney and opal glass shade are in a brass frame with heat deflector. The 15 line brass burner with flame spreader gives good light, burn time approx. 16 hours/fill. Overall height 28", total width 15"